So, it turns out I have become obsessed with experimenting with dry shampoo. I have posted before about various dry shampoo products before… including non salon Suave products, Tigi Dirty Secret, straight up baking soda… I’ve been around the dry shampoo block a few times. I have been using the Suave brand pretty religiously for over 6 months now because A) it smells so good and B) it works fairly good as well. But… I’m just over it. For whatever reason. I didn’t feel like I was getting the results I needed and while I love how it smells, that’s not a good enough reason anymore. 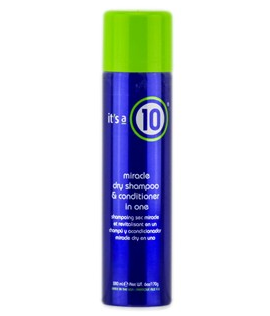 Last week I purchased it’s a 10 Dry Shampoo and Conditioner in One. The sales rep recommended it as her favorite dry shampoo, and I take product recommendations seriously. Honestly, I didn’t read anything about the product. She said it smelled good (selling point) and worked wonders for her. So..here’s my take. The first day, my hair seemed super shiny, but already a little greasy. I admit, it smelled great though! However that is not the job of a dry shampoo. Day two… we had a situation on our hands. And not a good one. Why did it look like I dipped my head in cooking oil?! Emergency hair wash. It’s a 10 fail. So…here’s the deal. I neglected to read that there is keratin in this product. Keratin, while a wonderful product, does not work for me. It makes my hair greasy and static-y…AND my naturally wavy hair wont hold a curl to save it’s life when under the influence of keratin. So…if you have SUPER dry hair…this might be for you. I simply cannot do it and will never buy this product again. It’s also a little bit pricey (I paid close to $22) and the combination of these qualities just did not work out for me. Sorry it’s a 10… I LOVE your other products, but unfortunately this is not one of them. I hate to be negative. Okay, time to bring in the good stuff. Oh…my. Sometimes all it takes is a product that does WHAT IT SAYS it does to get me excited. I’m so lame sometimes and I’ll be the first to call myself out. Ladies (and gentleman..maybe?) this needs to be your next dry shampoo purchase. Trust me! Best of all…I paid $12 for this. That is almost half of the other product. Kind of… math isn’t my strong point. BUT..I noticed this was listed at $8 for a lot of online retailers. Even better!! I am ecstatic about this stuff. Easily my favorite dry shampoo…ever. Don’t judge me, but I might even push the limits and see what Day 4 brings. Wish me luck! *For those of you who are curious, YES… I still shower. It’s called a shower cap, people. I didn’t abandon basic hygiene. Do yourself a favor and get out there and get a bottle of Batiste! Also… they make it in color specifics. I haven’t tried it yet but that might be next. I love it! Stay tuned for a recap of the best blow out I have had (thus far!) and more exciting reviews!